On Memorial Day we take time to remember all those who have served our country in the Army, Navy, National Guard, Marines, Coast Guard and Air Force. We eulogize these men and women who lost their lives in battle or extremely dangerous activities of warfare or other hazardous duties. Today we put aside our political and other societal differences in respect to every veteran. These heroes answered our nation's call to protect us from foreign enemies aggression or they provided urgent emergency assistance during extreme natural disasters threatening lives and property. On this Memorial Day in the International Peace Arch Park the Veterans For Peace have placed 1,667 crosses and grave stones to honor all the combat troops who have been killed in the Iraq War to date. This traveling memorial has attracted many peace activists who have come to support this and other global peace movements. 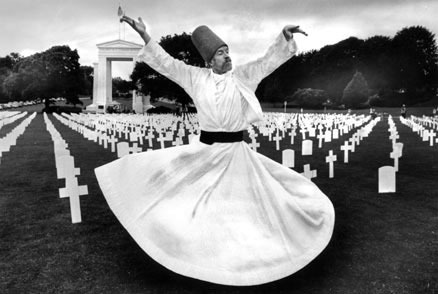 Raqib Burke from Vancouver, a Dervish who teaches at his School of Whirling has performed his sacred art in Turkey and countless locations in Canada and United States. As he dances for peace we truly believe that "one good turn deserves another."